Have you ever been caught in a sandstorm? If so, you probably would’ve known it. Strong winds… blackout conditions… dust everywhere. It sounds like I’m describing what happens when a hurricane makes landfall near the beach. But, nope — those are just some of the things you’d experience in a sand storm. By the way, a sand storm is the same as a dust storm. So, how do sandstorms happen? Where do they occur? What happens to all the sand that gets blown away in the wind? Here are the answers to all of these questions, plus incredible videos of sandstorms in action! How Does A Sandstorm Form? Sandstorms, also called haboobs (“habb” in Arabic means “wind” or “blow”), are a type of dust storm that can sweep up hundreds of tons of soil and spread it over thousands of square miles. A sandstorm can be caused by strong, continual gusts of wind that begin picking up the loose top layer of soil or sand across the landscape. What makes sand storms particularly dangerous is the fact that visibility levels within the dust storm can be reduced to virtually zero. Sandstorms can literally come from out of the blue. That’s right — it could seem like a perfectly nice day outside when, in the distance, you see a dark wall of dust moving right toward you. Within minutes, conditions will go from bright, calm, and sunny to windy, dusty, and pitch black. If you don’t believe me, check out the haboob in this video… Scary stuff! Where Do Sand Storms Happen? As you may have guessed, sandstorms usually occur in arid or semi-arid regions, where there’s a lot of bare sand or soil that can be easily picked up by strong winds. In the United States, the region that most commonly experiences sand storms is the desert Southwest. However, other areas can be affected by sandstorms if the conditions are right. Smaller dust storms can occur anywhere that there’s plenty of loose soil and gusty winds. Where Does All The Dust Go After A Sandstorm? Since tons and tons of soil gets blown around during a sand storm, you’d imagine it looks pretty messy once the haboob event is over — or, as I’ll say, once the dust has settled. Not to mention, there’s often a lot of damage that can occur to structures because of the gusty winds accompanying the storm. For the most part, when a sandstorm occurs in an uninhabited place — like in the middle of a desert — the dust stays where it lands until the next force of Mother Nature (likely another sandstorm) blows all that dust someplace else. When sand storms occur in or near cities (such as Phoenix, Arizona), the cleanup process is sometimes very lengthy and often means having to sweep up tons of dust and removing it with bulldozers, dump trucks, and other large equipment. Dust clouds can reach more than 10,000 feet high. Wind speeds in a sandstorm can reach 100 miles per hour. Sandstorms cake everything in their path with dust, so you need to cover your eyes, ears, mouth, and nose if you get caught in one. 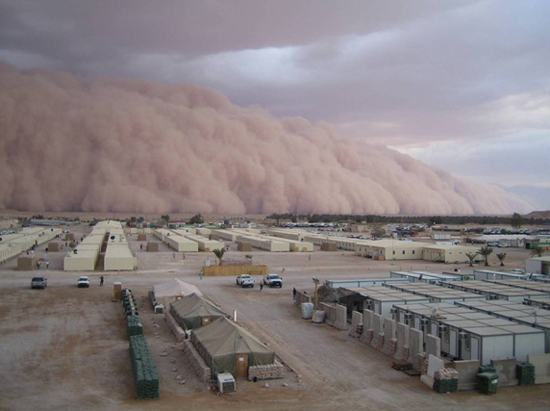 Sand storms are the third leading type of weather event to cause injuries to people. 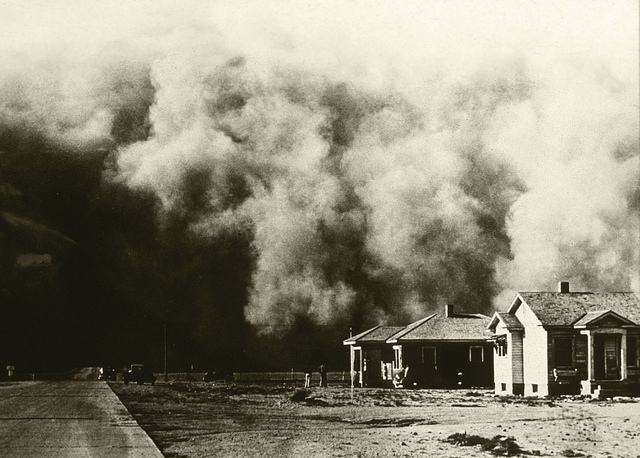 Dust storms usually occur in the summer but may also sweep through in the spring. Sand blown over the Atlantic Ocean from dust storms in the Sahara can help create some amazing sunrises in places like Miami, Florida.